South Sudan's flag was adopted on July 9, 2005, and was used as the Sudan People's Liberation Movement flag prior to the country's independence in 2011. 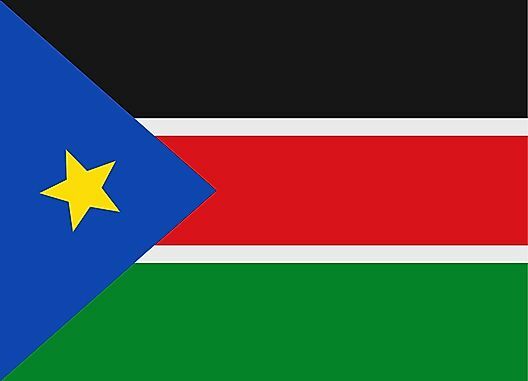 The flag features the Pan-African colors of black, red and green, as well as a blue triangle with a yellow star, which symbolize the Nile River and unity of the states respectively. The white lines are a celebration of peace after many years of the liberation struggle. 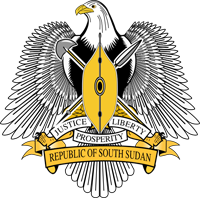 The coat of arms of South Sudan features an African Fish Eagle bearing a shield and crossed spears. The eagle is a symbol of strength, resilience and vision, while the shield and spears represent protection of the new state.